The 15th MEU (SOC) Realism Unit is not the United States Marine Corps, nor does it have any affiliation. We are not the real 15th MEU, nor does it claim to be. 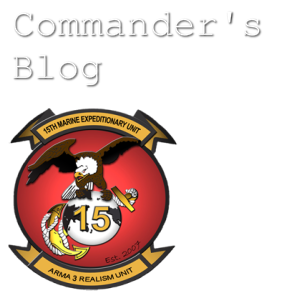 The 15th MEU (SOC) Realism Unit is a collection of gamers who have organized themselves into a realistic manner, adopting the customs and procedures of the United States Marine Corps, and adopted the name of the 15th MEU. The 15th MEU (SOC) Realism Unit does not take, generate, or disperse personal funds for any member. Any funds taken through Paypal are for the sole use of supporting game servers, our Teamspeak server, our website, and our domain name rights. The author of this blog, J. Penny, is not, has never been, and does not claim to be a member of the United States Marine Corps or the United States Armed Forces. He has never been, and does not claim, awarded any medals, payment, rank, or recognition by the United States Marine Corps or the United States Armed Forces.